An early learner's dictionary for spelling and writing. Early learner's dictionary of alphabet sounds. 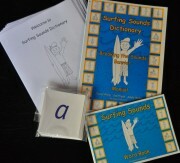 Activities to support learning the various vowel sound-spelling options.